How does breakthrough branding help fleet management’s breakthrough innovators? With its industry thought leadership and unfailing commitment to putting customers first, Merchants Fleet Management has experienced significant growth over the years to become one of the top ten US fleet management firms. Stackpole is pleased and proud to be Merchants’ longtime marketing partner and to have played brand stewards during this extended period of the company’s steady growth. Recently, in an environment where many of Merchants’ competitors seem more focused on expansion through merger and acquisition than they are on their customers, many companies are feeling marginalized and unsatisfied by what they perceive as a resulting lack of attention and service. Recognizing this window of opportunity, the Merchants/Stackpole team set out to further bolster the Merchant’s brand image, highlighting its premier customer service, innovative fleet leasing solutions and the benefits of dealing with a committed, high-touch service organization. Aimed primarily at fleet management professionals, procurement managers and C-suite decision makers at companies across the country, our new brand campaign set out to position Merchants as the progressive, scalable, fleet management thought leaders they are – with a level of “any day, night or day” customer service its competitors simply can’t match. Having worked so closely with Merchants for 14 years, we know better than anyone what sets this innovative company apart from its competitors and so developed the firm’s unique brand promise: Merchants will always keep you moving forward, by taking time out to stop and listen. Messaging built around that promise and highlighting our four newly identified organizational pillars was created, touting the firm’s: deep level of expertise; progressive-minded and technology-focused approach; a large array of tailored leasing solutions; and stability, strength and integrity. This powerful new messaging serves as the platform for all communications moving forward. 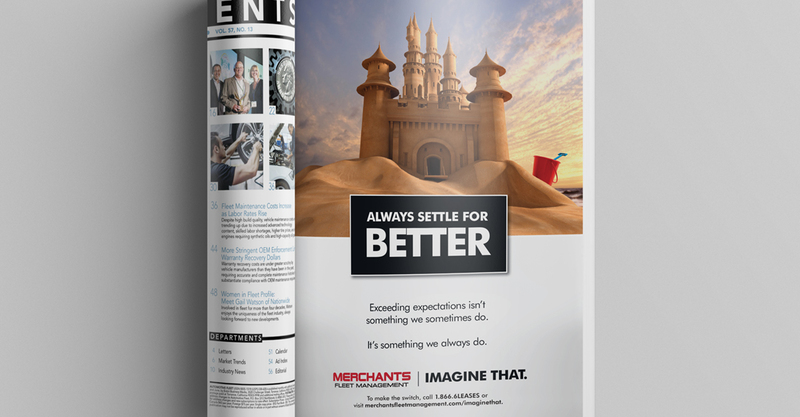 “Always settle for better” became Merchant’s new campaign headline, which came to life in dynamic new ads designed to stand out in a sea of industry complacency and sameness. Three new ads depicting the surprising “extra mile” Merchants goes for each and every client was launched across both print and digital platforms, with compelling imagery, bold, confident messaging and a new, thought-provoking theme line to play off the campaign theme line: Merchants. Imagine That.